External Affairs Minister Sushma Swaraj and her American counterpart Mike Pompeo have agreed to reschedule the postponed '2+2 dialogue' at a mutually convenient time and location as soon as possible, a state department spokesperson said. Swaraj and Defence Minister Nirmala Sitharaman were earlier scheduled to travel to the United States to take part in the meeting with Pompeo and Secretary of Defence James Mattis on July 6. But on Wednesday, Pompeo spoke over the phone with Swaraj to express his "regret and deep disappointment" at the US having to postpone the dialogue for "unavoidable reasons". During the phone call, Pompeo discussed further strengthening the US-India cooperation, the spokesperson said, asserting that India is "a major priority" for the Trump administration. "The secretary and minister Swaraj agreed the 2+2 dialogue would be rescheduled as soon as possible at a mutually convenient time and location," the spokesperson told PTI. The spokesperson asserted that the US-India relationship is "a major priority" for the Trump administration and it looks forward to continuing to "strengthen" the partnership, hours after the Ministry of External Affairs spokesperson Raveesh Kumar tweeted that during the call Pompeo expressed his “regret and deep disappointment” at the US having to postpone the 2+2 Dialogue for “unavoidable reasons". "India's central role in US national security is enshrined in the President's National Security Strategy, which noted that 'We welcome India's emergence as a leading global power and stronger strategic and defence partner'," the spokesperson said, without explaining the “unavoidable reasons". 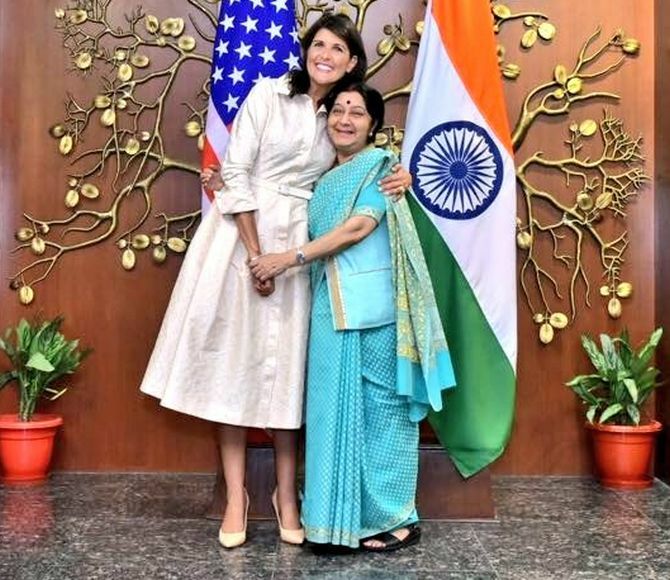 The spokesperson said: "US ambassador to the UN Nikki Haley is in New Delhi right now for a visit focused on advancing the US-India relationship and underscoring our shared values as the largest and oldest democracies committed to a rules-based international order." The decision to postpone the maiden 2+2 dialogue between the two countries has come as a disappointment for India watchers in the American think-tank community. "The postponement is disappointing," Jeff Smith from Heritage Foundation, a think-tank close to the ruling Republican establishment told PTI. "It is not so pleasing to see the 2+2 being called off. I believe the Trump administration is distracted with a summit with President Putin," Bharat Gopalaswamy from the Atlantic Council said. "Like the summit with North Korea, they believe they might be able to advance their relations with Russia, whatever that means in tangible terms. The US' relations with Russia have deteriorated significantly over the last 18 months and I believe the Trump administration might be able to turn around a corner with one of US's significant adversaries," he said. "So as far as I can understand, this is a very distracted administration but Trump has always had a fascination for Russia, Mr. Putin and the US being able to strike some sort of a deal with Russia. And that's where he has set his focus right now," Gopalaswamy said in response to a question. "I also do not think buying arms would be a concern for Trump administration. If that were the reason, why would Trump be focused on a summit with Russia?" he asked. For Joshua T White, a former Obama administration official, the postponement of the 2+2 talks was "unfortunate and more than a little embarrassing for the US". "But frankly I'm more worried that the growing cascade of disputes surrounding trade and investment will slowly sap momentum from this very important relationship," White, currently a fellow at the Edwin O Reischauer Center for East Asia Studies at The Johns Hopkins University School of Advanced International Studies (SAIS) in Washington, told PTI. Michael Kugelman from the Wilson Center alleged that with Trump at the help of affairs, no US' relationship was foolproof. "Safe to say that US-India relations have taken their biggest tumble in quite some time," he tweeted. "In the Trump era, no US relationship is foolproof," he said. "This is really big. 2+2 could have been used to reset a relationship experiencing growing tensions on the econ side," Kugelman said in another tweet. The new dialogue format was agreed upon between the two sides during the visit of Prime Minister Narendra Modi to Washington in June 2017. After June last year, the two countries have tried to schedule the dialogue many times with several dates having been considered. Earlier this year also, the '2+2 dialogue' had been postponed due to uncertainty over the confirmation of Pompeo as new Secretary of State. Pompeo was later confirmed as the US Secretary of State in April. Is the PM 'modi-fying' into Trump?